Preconstruction activities have begun on AquaVue Las Olas, a truly groundbreaking luxury residence opportunity in Fort Lauderdale. Scheduled to be completed in 2017, AquaVue luxury condominiums will offer the best of waterfront living. A boater’s dream, the complex will be set on a canal north of La Olas Boulevard and a stone’s throw away from Downtown Fort Lauderdale. The project is spearheaded by OceanLand Investments, who have been known for creating lifestyle-driven waterfront communities in South Florida for over 25 years. With just eight exclusive 2 bedroom, 2.5 bathroom units available, few will get to experience why Fort Lauderdale is truly called “The Venice of the Americas”. Home to eight boat slips capable of handling vessels up to 50 feet long, AquaVue offers direct access to the Intercostal Waterway and the Atlantic Ocean. Floor plans start at 2,849 square feet. 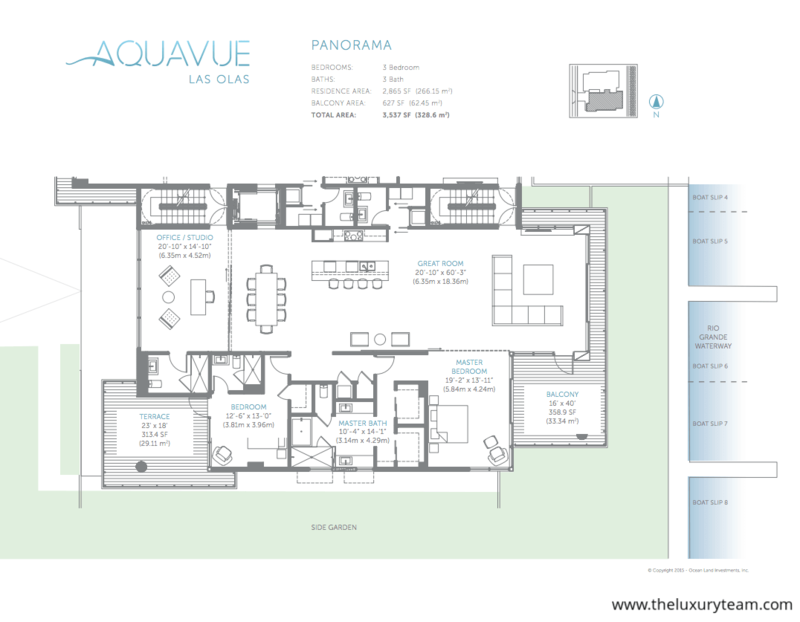 Every residence at AquaVue La Olas includes spacious loft-inspired floor plans with flexible layout options. These oversized, double corner units will all have plenty of outdoor living space on their oversized balconies with modern railings. Floor-to-ceiling impact resistant windows line each residence to take full advantage of natural light and open up the space. European kitchen cabinetry and quartz countertops create modern and efficient feel. All condominiums have SubZero and Wolf appliances that come standard. If you prefer to have a more closed off space, sliding partitions are available separate master bedrooms into optional separate bedroom or office space. In case you prefer smaller boats, AquaVue has plenty of outdoor storage space for your kayaks, paddle boards, and tubes. A resort-style heated saltwater pool sits waterfront surrounded by an open air pool deck and living space. With 120 feet of waterfront access, there is plenty of room for barbequing and outdoor entertainment. A secure parking garage is home to two=secured parking spaces per residence, and is equipped with electric vehicle charging stations. You can ensure your family and belongings are safe with 24-hour video surveillance and secure entrances. 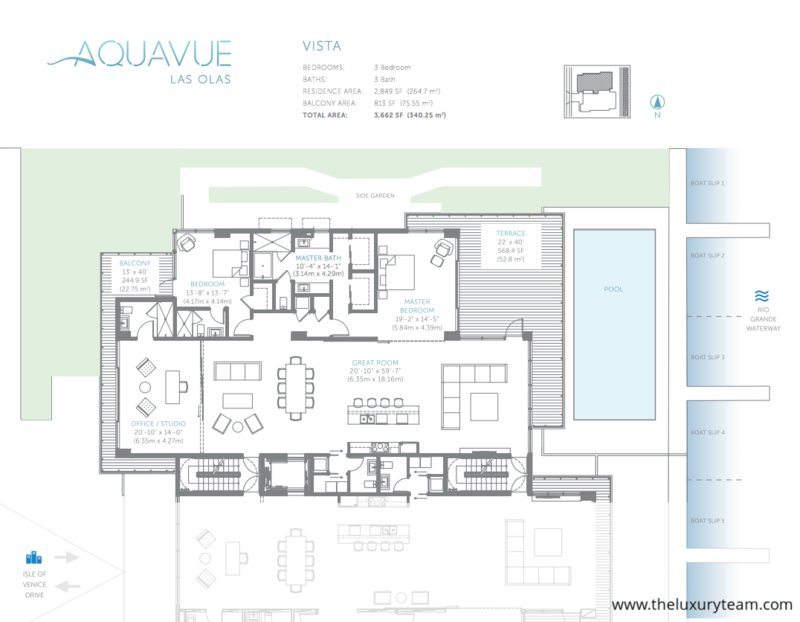 If this luxurious and secluded lifestyle isn’t enough, AquaVue is just a short walk from La Olas Boulevard and the bustling downtown Fort Lauderdale area. You will be just a short distance from world-class dining, entertainment, nightlife, and cultural events. The La Olas shopping district is renowned as one of the best in the world, attracting top designers from Miami to Milan. Located directly between A1A and US-1, AquaVue provides easy access to I-95 and Fort Lauderdale International Airport. With just eight exclusive luxury condominium opportunities available, don’t miss out this scarce chance to experience waterfront living in Fort Lauderdale!